This one year program is designed to prepare Physician Assistants (PA’s) for careers in psychiatry. It is essentially a “mini-residency” in psychiatry, highly integrated into the psychiatry residency training program. Our PA fellows spend most of the first half of the year serving in capacities similar to our 1st and 2nd year psychiatric residents, rotating through various inpatient settings, and the second half of the year in primarily outpatient settings, serving in capacities similar to our 3rd year psychiatry residents. 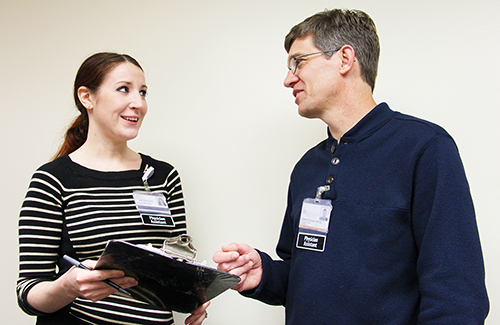 In addition to exposure and supervision in a broad array of clinical settings, PA fellows also participate in all of the didactic activities designed for our junior residents (including assessment and diagnosis, psychopathology, psychopharmacology, communications skills and supportive psychotherapies). The full curriculum for the program as well as well as details about salary and benefits can be found here. Applicants must be graduates of an ARC-PA accredited PA program, and must have passed or be eligible to take the Physician Assistant National Certification Examination (PANCE). They also must be licensed to practice as a PA in Iowa prior to the start date. As the impetus for the development of this program was to specifically address the psychiatric workforce shortage in Iowa, and as funding from this program is largely from the state, we prioritize those applicants who are most likely to remain in Iowa for at least several years (and hopefully longer) post-training. Inquiries are accepted throughout the year. Our funding only allows for one fellow per year. Salary is $65,000 per year, plus a generous benefit package. We are somewhat flexible in terms of start dates, although it is optimal to coordinate the timing as closely as possible to that of the psychiatry residency schedule, i.e, to begin in or around July. Interested applicants should contact: Don St. John PA-C (program director) and/or Michael Flaum, MD (medical director).